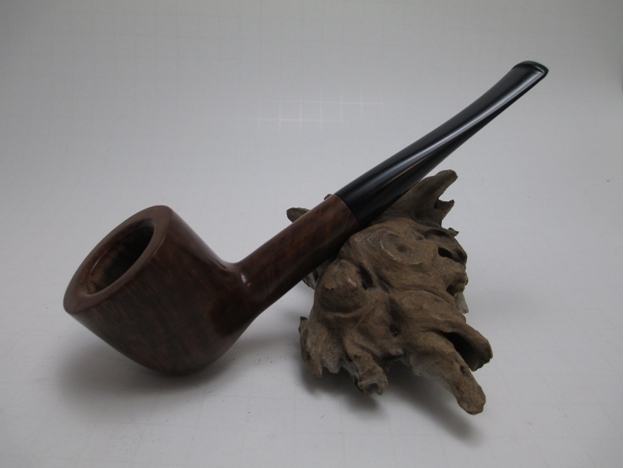 I picked up this nice looking Hardcastle pot, but when it arrived I realized that it did not have the proper stem. Fortunately Steve bailed me out and sent a couple of likely replacements. 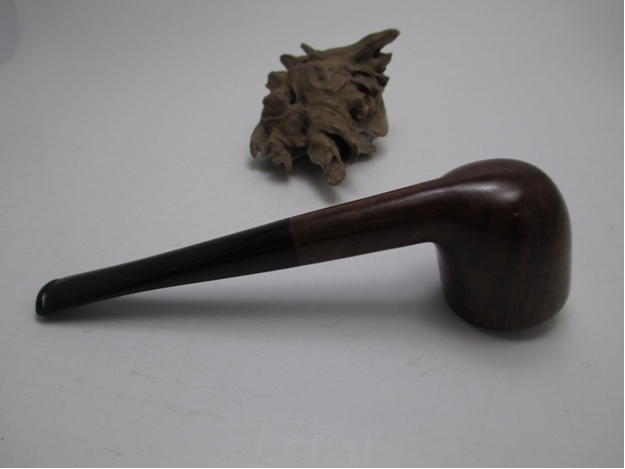 The stem that I settled on had a slightly smaller tenon diameter and the outside diameter was noticeably bigger. This was going to be a fun challenge. 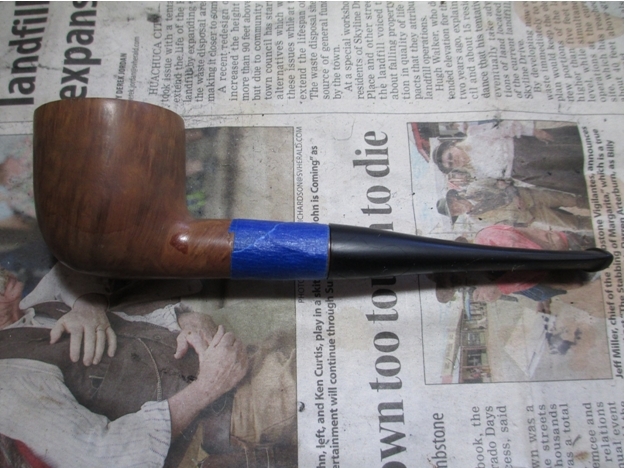 I covered the shank with painter’s tape and started reshaping the stem with 100 grit sand-paper. Here is a shot after getting to about 80% completion. 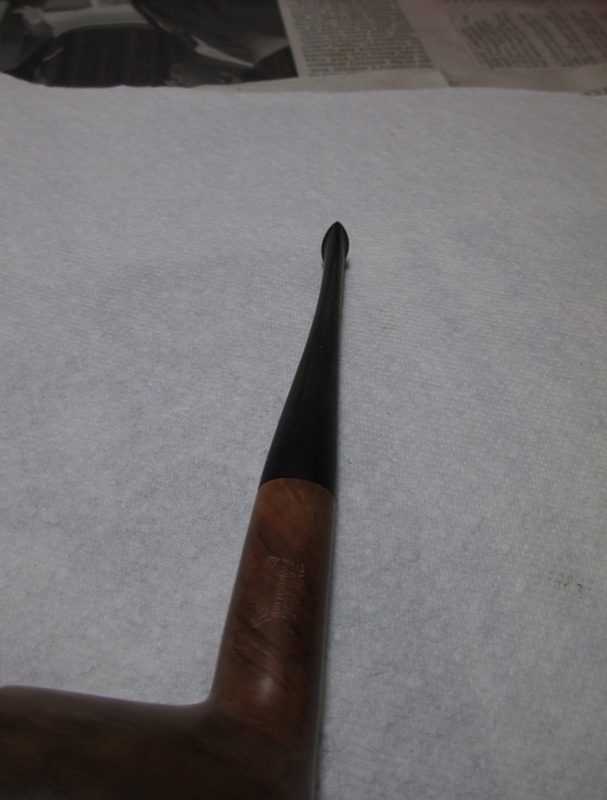 Next, I took the painter’s tape off and replaced it with Scotch tape (since it is thinner) at the end of the shank. 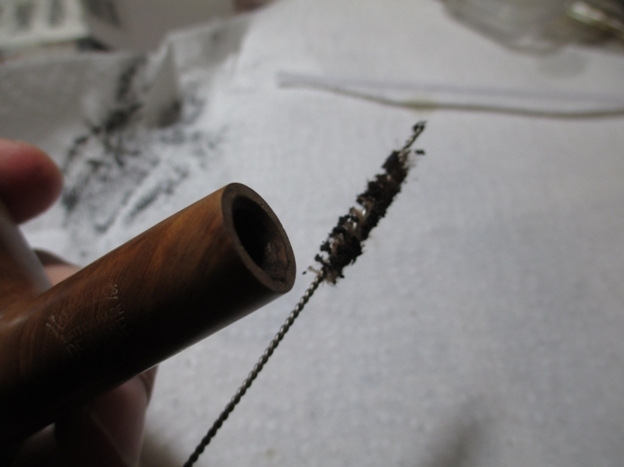 At this point I was using 400 grit wet/dry without water. 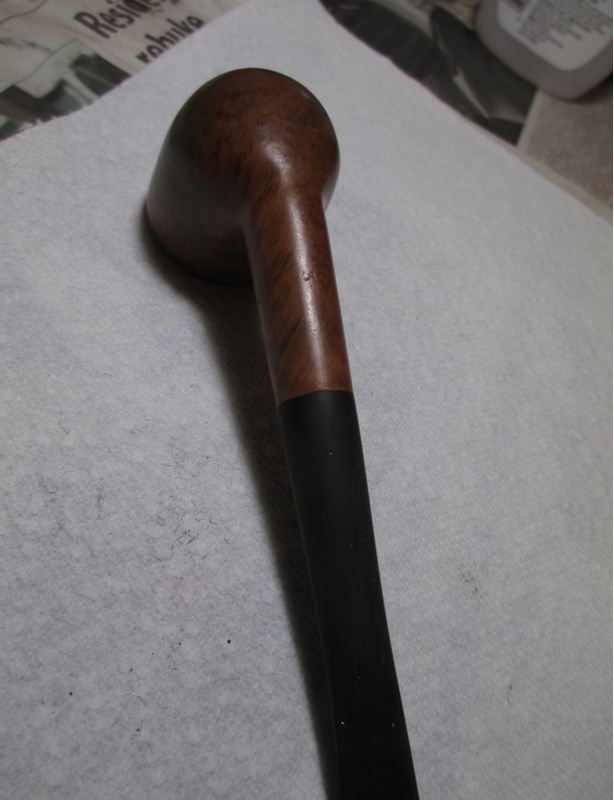 Once I completed that step, I took a rubber washer and placed it on the tenon to protect the end of the stem and shank. 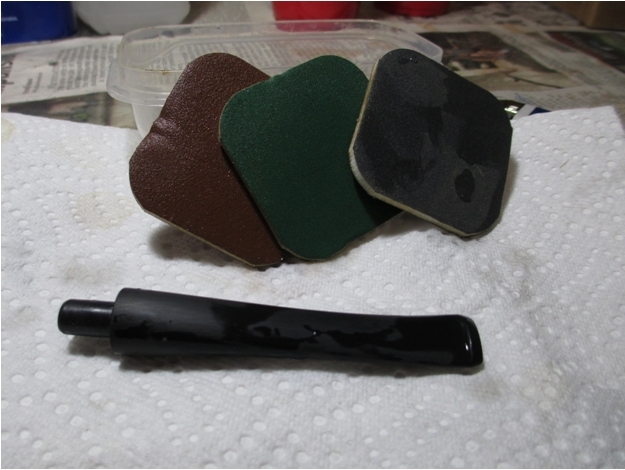 I used 400 grit to finish the last little bit, frequently taking the washer out to check the fit. 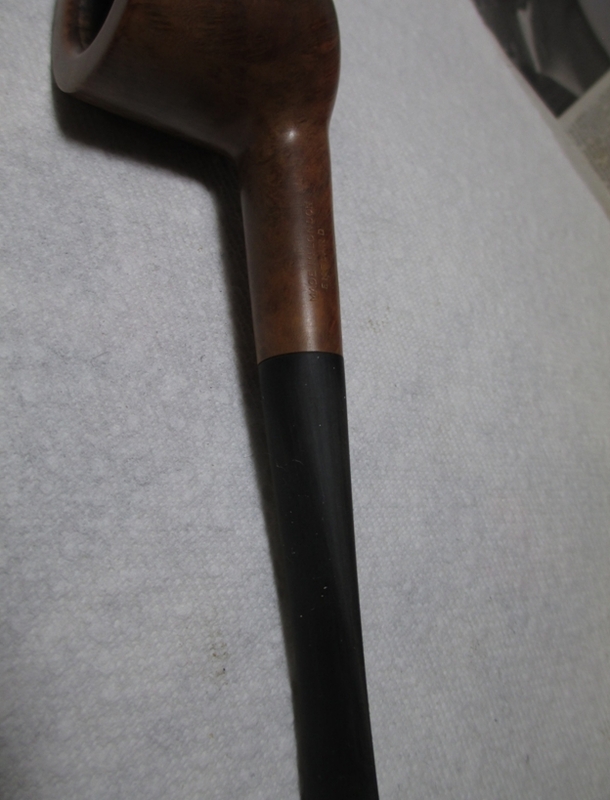 This is what the pipe looked like once I had the stem sanded to fit. Next I turned my attention to the bowl. 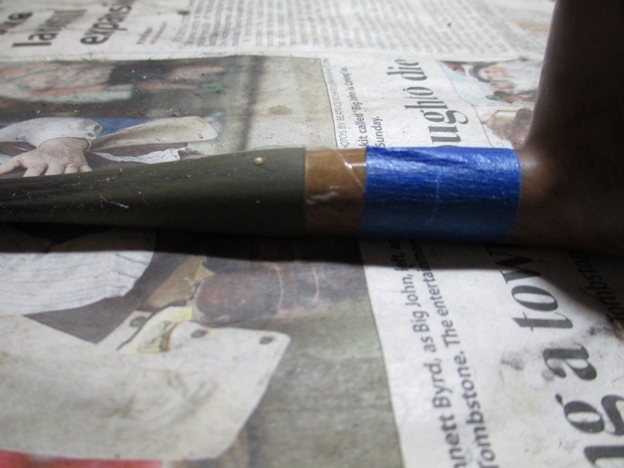 I used the largest reamer to get almost to the bottom and finished it with the next smaller one. 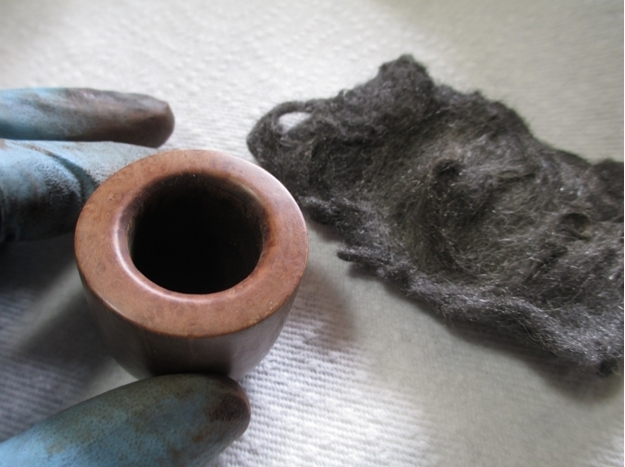 I used OOOO grade steel wool to remove the tar from the rim. 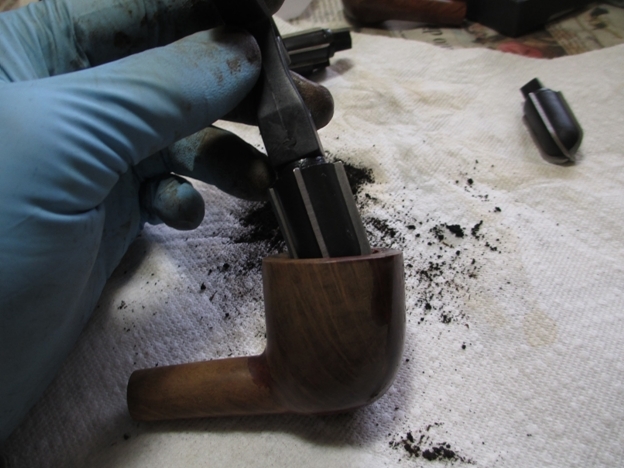 Once the bowl was clean, I used my retort to clean the shank. 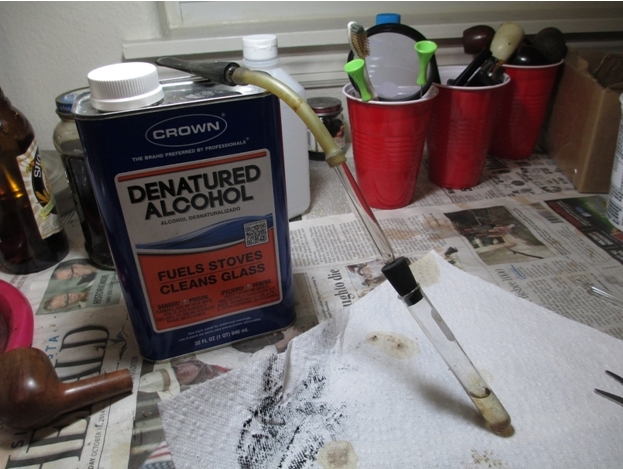 This is why I am a firm believer in the retort, pipe cleaners dipped in alcohol came clean, but all this gunk was still inside. 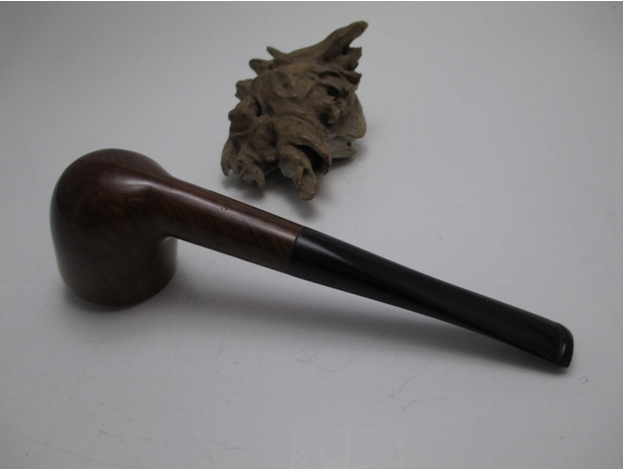 I used the retort on the stem. 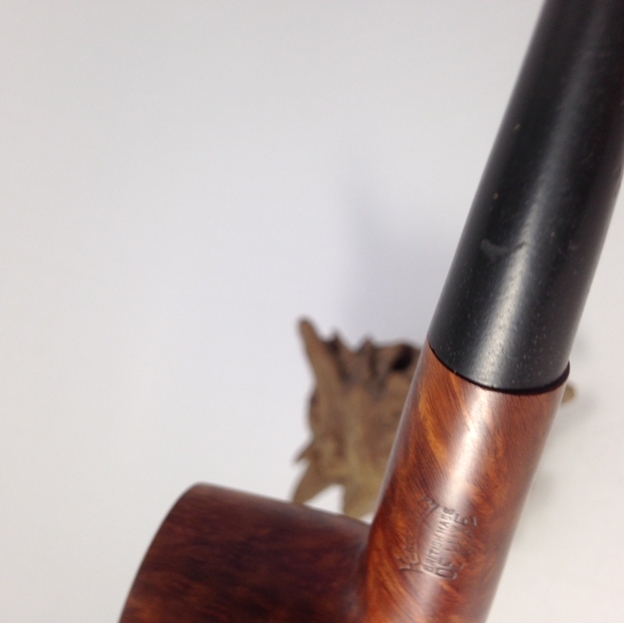 Although this picture does not show it, always plug the end of the stem to prevent the retort from boiling over and spitting nasty tobacco juice everywhere (ask me how I know this). 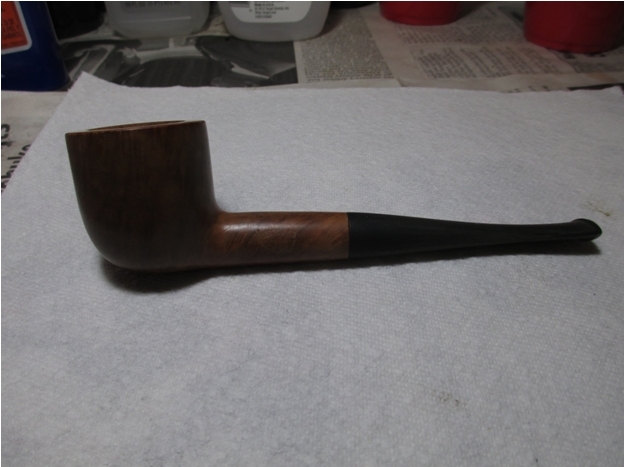 After the stem was cleaned, I worked on polishing it. 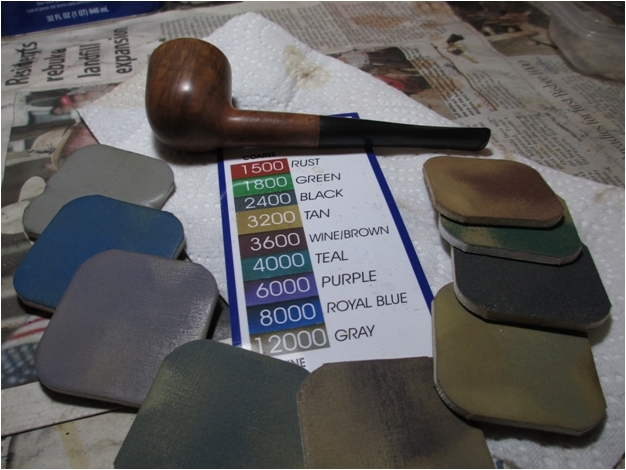 I started with 400 grit, then moved to 1500 through 2400 grit micro mesh with water. 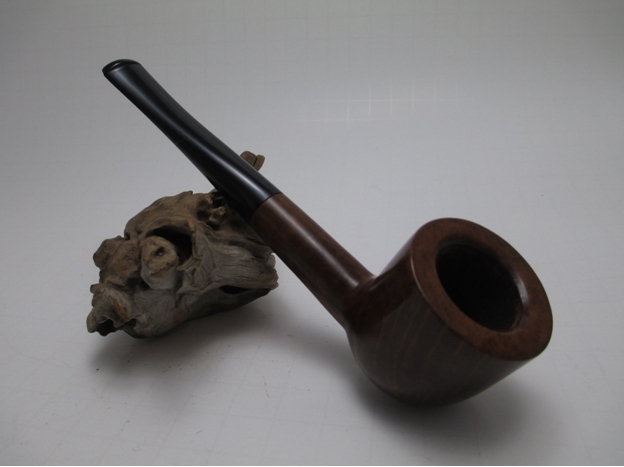 I used the 1500 grit through 2400 grit without water on the bowl, then finished both with a progression through 12,000 grit. 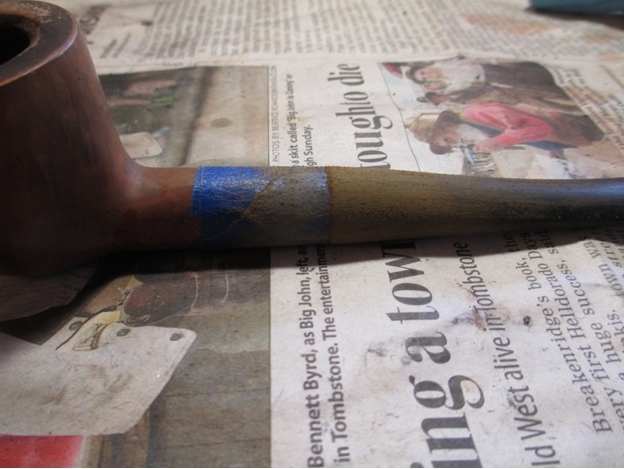 Now the pipe was ready for stain. 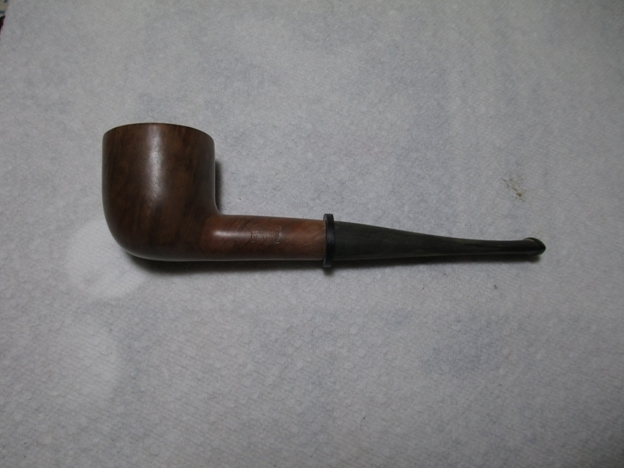 This time I used an aniline dye (light walnut) from Pimo Pipe Supply. 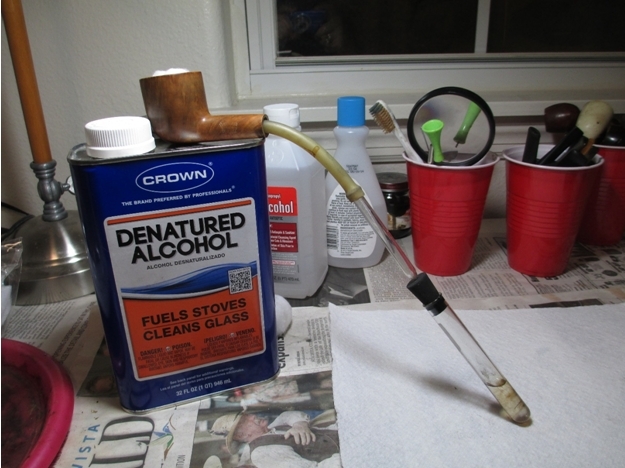 I diluted the dye by 50% with denatured alcohol, applied it with a cotton ball, flamed it with a lighter, and repeated until I had the coverage I wanted. 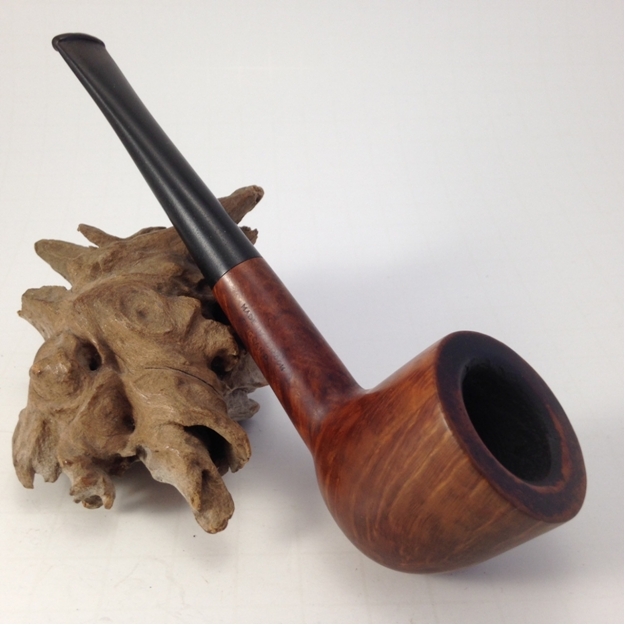 After an uneventful trip to the buffer, where I used white diamond and carnauba wax on both the stem and bowl, this is the result. I am really happy how this turned out. Thanks again to Steve for his generosity in providing the donor stem. 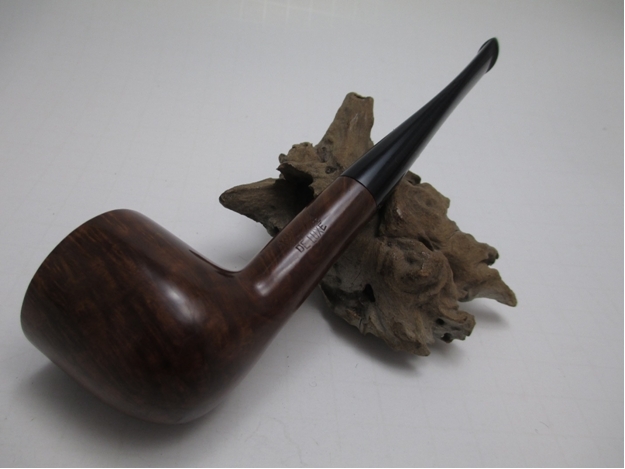 This entry was posted in Pipe Refurbishing Essays and tagged Andrew Selking articles, article by Andrew Selking, Bowl - finishing, Bowl - refinishing, Bowls - refinishing, cleaning a pipe with a retort, finishing, fitting a stem, Hardcastle Pipes, Hardcastles, micromesh sanding pads, Oxidation, pipe refurbishing, refinishing, refurbishing, restemming a pipe, sanding a stem, shaping a stem, stem work, using a pipe retort on December 6, 2014 by rebornpipes.